I just wanted to say a big thank you to everyone for participating and rocking out last night. It was for me at least a small dream come true to be part of a band… and a talented HOT one at that! Well done everyone! People in the audience commented on your moves and really interesting responses. People were fascinated. I think it helped with the credits at the end, as it contextualised second life and that you are all autonomous avatars. Otherwise some may have thought it was just a video. It’s great to hear that your tech went so well, between the little details of unfamiliar stuff and just the stress of also being on stage, that’s pretty impressive! Hey Owen and band mates! I’ve done several of Vanessa’s performances in SL in the past and I have to say this was one of the most enjoyable. The idea that there was a live audience of folks listening to you play and watching us cavort around in our avatars was intriguing and I really look forward ro seeing the video and photographs from your side. Anyway I am really pleased that it went well for you and the audience enjoyed the show. Ono Okoy, Aeon and I really enjoyed this adventure and we thank you for using our little corner of the metaverse for the SL portion of your piece. We thank Vanessa too, of course, for bringing us into it – and Monerda and Trilby and everyone for their exuberance and other assorted specialness. What a treat! We can’t wait to see the video of the entire piece. Thanks for the view into this event. I, too, and looking forward to the visuals! Great rehearsal today. Exciting to see you all in one place! You are a trooper on the SL bit. You did just GREAT, even with glitches and learning curve. So good to have you in-world – and we hope you enjoy SL, whatever you do from this point forward. Let us know if you need anything at all. I really had a great time with the rehearsal, and am rarin’ to go for Friday! Aeon has agreed to count the time. We will walk to the stage and take position at our instruments. We will stop playing, leave our instruments to gather at the front of the stage to clap, etc. Owen will let us know when everything has concluded. One or both of us will be there early, and our assistant, Mimi, may be there, depending on her actual schedule. Since there was no audience requirement, we did not advertise this as an event. We should not be distracted by visitors, although people do drop in at Ce Soir at various times that we largely do not control. We will, however, set the sim to G temporarily to ensure that Owen can TP in. VOICE will be OFF on the sim, as we are not using it. Please turn off streaming music in your viewers, as we will allow our usual stream to continue playing for visitors since we are not using the stream for this event. Rest well tonight. See you tomorrow! PS: I am wondering if Owen knows how to turn off his SL streaming music, so we’ll just remove the stream for the performance. No worries! cool will figure it out, is it possible for the avatars to wear the grass beards? why don’t you keyword sift through here and see if you see a “Grass Beard” or “Gas Mask” or some other thing you like that we can wear. Don’t worry about any prices you see, everything is cheap and I’m happy to pay for them. Ok I have made a list of possibilities… links here. 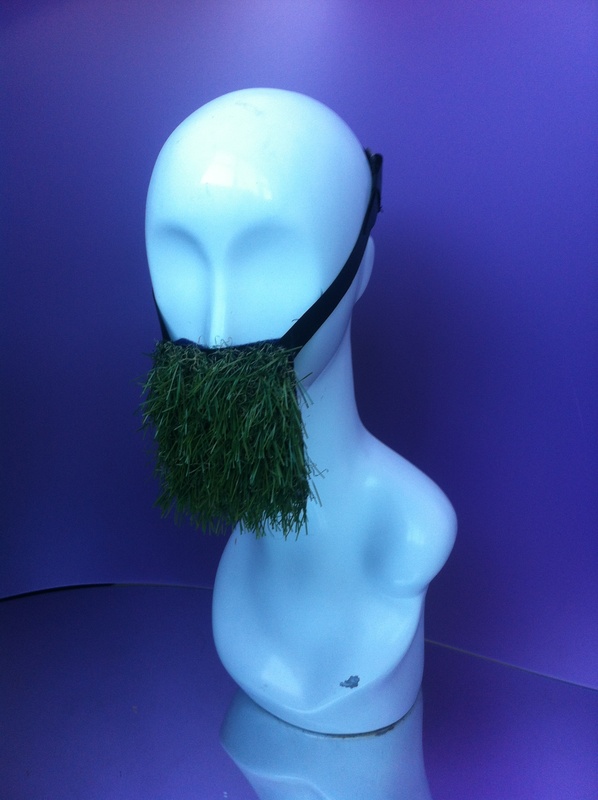 The idea is that we all wear the grass beards… because the whole band including me and the audience in my venue will be given grass beards to wear. If you can’t make a grass beard, maybe something strange or green could cover the mouth? no features, but maybe paint grass beard on it? On Thursday 14th is it possible to do a rehearsal? After 3pm GMT? Thursday is difficult… but Wednesday is great! OK I will try to get a space and projector for wednesday. what time? Same as you said is ok, after 3p GMT? Ok great. I will try to organise a space and projector to rehearse at 3pm GMT Wednesday 13 November. I have already installed second life on my laptop, will i need anything else apart from a projector and camera?